Home BUSINESS Thika hawkers support Wa Iria’s bill on street hawking. Thika hawkers support Wa Iria’s bill on street hawking. 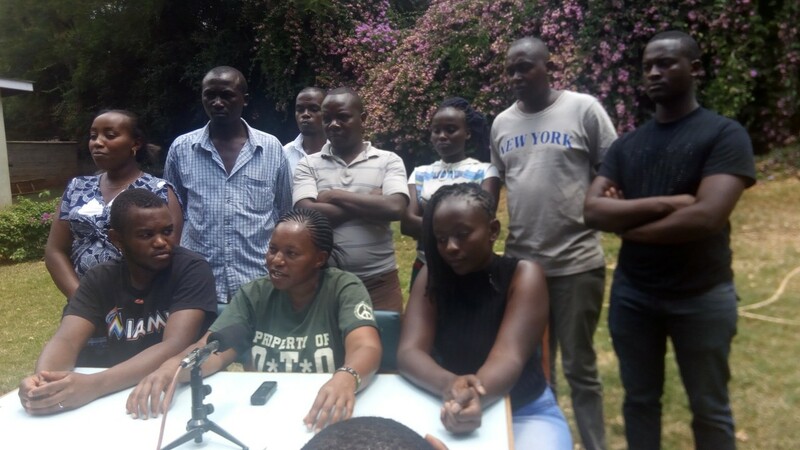 Jane Wangari (centre) addressing the press where they threw their weight behind Murang'a Governor Mwangi wa Iria's bill on hawkers. A section of hawkers who ply their trade in Thika Town have supported the proposed bill to the National Assembly by Murang’a Governor Mwangi Wa Iria seeking to protect informal traders terming it a move in the right direction. Speaking to the press during a press briefing, the hawkers said that the bill was long overdue as they have over the years suffered a lot for lack of a comprehensive programme to accommodate them. “We are basically ignored by the authorities when it comes to planning. This has led to many of us to fall prey to county askaris who take advantage of the confusion to fleece us and confiscate our merchandise causing us huge losses,” said Jane Wangari who vends eggs and sausages. She reckons that hawkers are an integral part of urban economies and a source of livelihood to very many youth and women. Wangari appealed to legislators in the current Parliament to support the bill as this will help the authorities to come up with the right modalities to not only regulate vendors, but also identify specific areas for hawking with no restriction. “The hawking menace can never be solved through hunting us like criminals but through an organised stature across the country where we get facilitated to work and also generate income for county governments through the payment of trade licences,” suggested Kelvin Mwaura. Mwaura also suggested that hawkers be given identity cards and a regulatory environment be created for their activities. “In my opinion, this bill should come up with modalities to identify areas for hawking with no restriction or areas with restriction in regard to day, time and area which would be marked as no-vending zones as previously implemented in Nairobi City,” Mwaura added. In regard to allocation of space, Mwaura proposed that county governments should be guided on how to regulate allocation of space based on proximity to potential clients. “The county government can secure some land within the proximity of the CBD which is easily accessible and near majority of the residents. To match the number of applications with the number of spaces available, the county government can construct a storey market so as to accommodate as many of us as possible,” said Mwaura. Caroline Wangui, a fruits vendor, narrated some of the tribulations they undergo in the pursuit of their daily bread. She says that the hawking business had been turned to a cat and mouse game where one had to live with if they wanted to survive. “Each time they arrest you, you get fined between sh. 500 and 1000, which at times is equivalent to the total cost of the goods in question. This means that you end up opting to let go of your goods as it makes no sense following them,” she says. Governor Wa Iria said last week that he plans to sponsor Hawkers Bill in Parliament to protect informal traders arguing that they were major economy drivers. Wa Iria argued that micro Economic intervention empowered the grassroots. He pointed out that most urban spaces were not designed to empower people or provide vibrant places where opportunities for small entrepreneurs and informal activities (hawkers) could trade and manufacture at viable locations. To solve some of the biggest challenges facing urban centres in Kenya, the governor suggested that authorities needed to tackle the issues of unemployment through the provision of viable areas for self-employment opportunities as well as improving the quality, standard of living and infrastructure.